The name says it all, the Simple Shower nozzle screws onto the top of any 20 oz. or 2L. 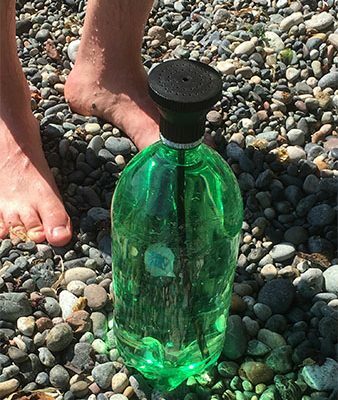 bottle to emulate a “shower head” flow of water. 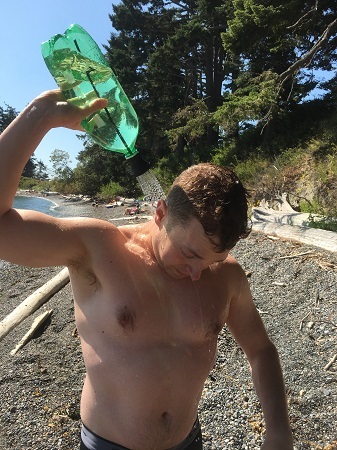 Attached to the nozzle is a long straw which regulates the flow of air into the bottom of the bottle to keep the water flowing at a constant rate (it keeps the “glug” from happening). Definitely not complicated. When you are ready to use the Simple Shower you just turn it over and the water starts flowing. If you want a hot shower just stick the 2L. bottle in the sun to heat it up pretty quickly. In use the Simple Shower is great. Water flows out at a nice rate. Its fast enough that you can rinse shampoo out of your hair or sand off your feet. It also flows slow enough that you have enough time to rinse your entire body off with a bit of water to spare when you use a 2L. soda bottle. Where the Simple Shower struggles is when you are not using it. There is no way to turn off or store a ready to go Simple Shower without unscrewing the nozzle and putting the original cap back on the bottle. This doesn’t seem like a big deal but what do you do with your Simple Shower when you aren’t using it? On my first outing I lost the 20oz. straw (it comes with two strays – one sized for a 20 oz. bottle and one sized for a 2L. bottle) and misplaced the cap for the 2L. bottle (I think they got mistaken for trash and thrown out by someone cleaning up our beach lunch spot). Small parts end up rolling around in the bottom of a bag and eventually get misplaced. This also means you can’t have the Simple Shower staged and ready to go in the trunk of your car. The Simple Shower is a great concept that needs one or two more refinements. If you are interested in this product consider a more typical solar shower instead. This entry was posted in Activities, Activities, Car Camping, Activities, Fishing, Gear, Personal Hygiene, Product Review, Activities, Sea Kayaking, Brands, The Simple Shower, Activities, White Water Rafting.